Most doors can be broken into in less than a minute. Locksnapping continues to be on the increase and practically all burglaries in the Sheffield area are via this method now. Lock snapping, what's it all about? The vast majority of homes in the Sheffield district are held secure with the help of a euro cylinder, which has a weakness. This can allow a burglar to gain quick and extremely quiet access to properties in less than a minute. In some cases under 15 seconds! 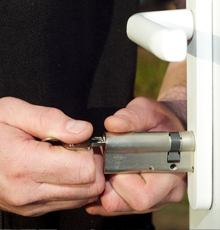 Lock snapping is the preferred method of attack by burglars now. There has been a spate of BBC and ITV reports to highlight this situation and a quick look on You Tube will give you more exact instructions on how to carry out this method also! The euro cylinder was made to make lock changing easier in a multipoint lock which are found in uPVC doors, which were becoming the standard fitting by the double glazing market. The way lock snapping works is that if enough force is applied to the cylinder it will break at it's weakest point. After which the burglar will have access to the internal locking mechanism and can then unlock your door. There are now available euro cylinders that will completely resist this method of attack and protect your property. SF Locksmith can change over your existing weak euro cylinders to these very high security antisnap locks. The appearance of your door will remain virtually unchanged but your security will be increased immensley. How they work is best described in a home visit and demonstration. There is no charge for this and no obligation to have your locks changed straight away. The thieves invariably have to break the bottom half of the outside handle off before snapping the lock cylinder. The bottom screw that holds the handle on are often thin and weak. Pas 24 handles offer the ultimate resistance to this procedure. Made of extruded aluminium they protect the lock from attack and offer a visual deterrent to protential thieves. These handles will not fit all doors but do the vast majority. Add these handles to an antisnap lock and you can be safe that no thief will ever be able to access your door via lock snapping. For more information and a free quote on anti-snap locks in Sheffield contact SF Locksmiths now.